The following is a list of SBCs (Single Board Computers), Embedded PCs and other computing platforms that will allow you to run RoboRealm right on your Robot. This list does NOT include Laptops and/or Netbooks of which just about all can run RoboRealm without issues. But often you may not have a mobile robot that is large enough to support a laptop or even a small netbook. This list is for those looking for even smaller platforms and includes platforms we know will support RoboRealm in one way or another. This miniature computer can run RoboRealm (assuming WinXP is installed) and provides a shared 24 PWM servo or digital IO pins and 8 analog in pins (not to mention the ability to attach a USB webcam!). This PC was built for embedded robotics and offers a great solution for onboard processing with RoboRealm. We've even created a RoBoard module specifically for this board to allow you easy access to all the PWM, digital and analog pins. Note that you get the RoBoard minus operating system. You'll have to install your own which can take a while to do (WinXP installation just takes a while to accomplish). We also recommend purchasing at least one VGA card which is needed for the initial OS installation. If you plan to purchase more than one board you can operate a RoBoard without a VGA card but you MUST use Remote Desktop (aka Windows Terminal Server) to connect to the RoBoard as other screen scraping desktop sharing applications like VNC will appear black once the VGA card is removed. It is currently the only PC based board that we are aware of that includes servo and IO directly on the board without needing a secondary board that will run a full flavor of Windows. Built originally for cars and boats this small PC makes a great RoboRealm platform. Comes with WinXP installed, has a bunch of usb ports for cameras and comes with a wireless LAN to make remote robot connections easy. This is very much a plug and play system with no assembly (of the PC) required. Note that you will still need extra boards to communicate to servos and motors as this is just a PC. Probably the most popular line of boards for use on mobile robots. The ITX line has been around for a while and offers a large range of options in terms of PC processing power. 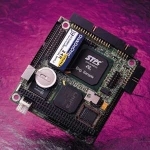 This board is already in many commercial robots such as the CoroBot from CoroWare and the Traxster/Stinger line from Robotics Connection. Keep in mind that the majority of ITX products will require memory, powersupply and the installation of some Windows OS. If you are comfortable with this level of IT assembly and installation the ITX will be a good solution. PC104 is a popular standardized form-factor for small computing modules typically used in industrial control systems or vehicles. PC104 gets its name from the popular desktop personal computers initially designed by IBM called the PC, and from the number of pins used to connect the cards together (104). There are literally 1000's of choices here but all will require a comfortable knowledge of putting together boards and configuring them to run with the installed Operating System. This is similar to the ITX line of computing devices but do provide a better extensibility using the PC104 bus (something most ITX products now also support). Know of something that should be included in this list? Then please contact us and let us know!